Harold Baker : Surf Bathing, 1910. With Articles On Special Subjects By Leading Australian Athletics. (Health Strength Skill). Melbourne. G.Robertson & Co., 1910. The chapter on surf bathing was written by Harold Baker, a brother of the author. 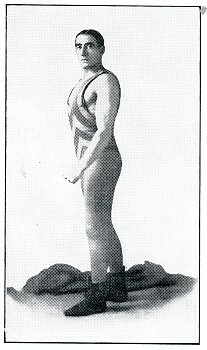 William Harold Baker (1887-19620 won three state swimming championships in 1906 and captained the Australian water polo team. Captain of Maroubra Surf Club in 1900-10, on 28 January 1910 Harold took part in a famous surf rescue of over 100 people at Cronulla Beach and was awarded the Albert Medal for bravery; a public subscription for him raised £1000 in its first week. From late 1913 to 1915, as Harald Baker, he was the swimming and surf columnist for Sydney's Evening News. He represented Australia in Rugby three times against New Zealand and won boxing and wrestling championships. Along with contributing to his brother's book, Harold worked for Snowy at Stadiums Ltd, refereeing many important fights, including several featuring Les Darcy.. While gently the waves seem to rock you to rest"
How can I hope to tell of the pleasures and of surf bathing? The words quoted will, perhaps, help some to understand, in a small degree, the wonderful fascinations of the delightfully healthy pastime of "surfing," or, more correctly, "breaker shooting." As breaker shooting, or "cavorting," is a much more scientific performance than the every day indulged-in sport of sea bathing, I will endeavour to describe it in its order, and enumerate some of the recommendations of the "surf." One has only to visit the numerous beaches surrounding the city of Sydney to see its wonderful effects. How many of our friends do we know who have been delicately inclined, and ordered into the open air, and have become surf converts? Almost any of these once unfortunate beings could, at this moment, be pronounced "absolute cures." I have at this moment a friend, said to be an incurable consumptive, and he swears by the surf, together with the sun. This may seem paradoxical, as most chest weaknesses are ordered away from the salt air. However, such is the case. There are hundreds of persons taking to the surf nowadays for reasons other than those of pleasure. One of its most particular claims is laid upon those suffering from obesity. Very seldom will be seen a regular surf bather suffering from that complaint, which, I think, goes to show its effect on the abdominal regions. These things may be classed under the heading of "curative effects 6f the surf." Leaving these, I come to its "formative values," as applied to the human frame. Go to the beach and cast your eyes over the many hundreds bathing there. What grander sight is there to behold? The surfers are all bronzed of colour, full in chest, and thick of limb. The surf will not, in its true sense, tolerate a weakling. ... until he reaches a respectable physical standard. Only the surf- bather knows the physical effort called for in getting out against a good sea, taking a good wave, and hanging to it, till it lands him on the sand. No; 'tis something more, requiring a considerable amount of stamina. One unacquainted with the ocean, might remark that he failed to see where the work came in. He has evidently never "taken" a breaker. To dispel his idea, let me take events as they happen when you enter the water. First, you have to swim out probably one hundred yards to the line of breakers. This is no mean effort in a "lumpy" sea. On getting out, you will have to hang about for a while until a decent wave happens along. it is, you will have to keep ducking under waves, to maintain your position. Eventually the wave you fancy comes along; you take it and go up ,ashore, your body tense, and your breathing restrained slightly. This, I am sure; is a physical strain, but one relieved by the exhilarating sensation of "cavorting" the wave. There is as much "fitness" required in breaker shooting as in most other games, but it is gained under much more pleasurable circumstances than in other pastimes. I think I have dealt sufficientlv with the curative effects of bathing, so I will now advance to the highest stage of surf-craft, and endeavour to explain to the readers of this book how to shoot a breaker. To begin with, the man who has done a fair amount of bath swimming and racing will be found to adapt himself to the peculiarities of a wave much more rapidly than one who has been debarred from the advantages of an up-to-date swimming club. Hence are to be recognised out in the further line of breakers such men as Healy, Wickham, the Martins, and Colquhoun-Thompson, all members of the East Sydney Flying Squadron team, besides Read, F. C. Williams, Bell, and many others well known in the racing world. These men are some of our best shooters, and I quote them to show how much better the fast men are than the slow. Now, as to the method of taking a wave. The shooter gets out to the line of breakers that he intends to take off from, and there he remains till the most suitable wave rolls in. ... most suitable, because a lot depends upon the choice of breaker to take. You may have to allow four or five apparently decent waves to go by before you get one that you can take, the others being either "dumpy" or "short runs." These defects in a breaker I will explain later. At last you have decided upon the wave you want. It is rolling in now. Possibly you will have to go out and meet it, or maybe you will have to come inshore a little to get it on the ''catch' or "pick-up." The "pick-up" or "catch" is that part of the wave which has a tendency to lift you up, and carry you onward with its rolls. It is that part which is still green water, but is about to turn into a "comber" and run inshore. The reader may ask, At what point do I take the breaker? Well, you take it when it is about to turn from green water into a foaming billow. There is absolutely one moment when you must get off on a wave, and that is the instant the breaker "catches." If you get away late you will find that you will be buried in the wave all the way ashore, or that you will drop behind on the take-off. Then, again, if you take it too soon it will break on the top of you. From this you will gather that there is that one instant only for the "pick-off." Of course, onecan shoot a wave long after it has turned to foam in a sort of way, but it lacks that fascinating sensation of coming down the crest of a billow - a sensation one never tires of. A word here as to the most desirable waves for shooting. The one I would fancy would be of fairly large proportions, rolling up lazily with a second bank behind it. This wave will be known to most surfers as a "double-banker." It will be fast, and certain to land you on the beach. Should the front one become expended, the second one reinforces it, thereby making it the best style of wave to shoot. But the "double-bankers" do not often come along. The next best wave will be the green comber, that breaks and runs down its own body, being free from a "dump." This wave can be taken by even a moderate shooter. There are some things that must be avoided in a wave. Should the shooter be just in the act of taking off, and the wave rear itself up in such a way that it presents a wall-like appearance, you must immediately pull back, or the consequence will be that you will be grinding and churning in the sand. That wave was a "dumper," so be careful next time. ... wave, and is on the alert to avoid it. The dump or drop in the breaker is caused by the wave getting up so high that it loses all its body, and falls straight down again into the sand. Almost any other wave can be taken in safety. Regarding shooting ashore in a breaker, and landing on the beach, I have had the question put to me by some sage-looking persons, as to whether I turned my hands round like a propeller whilst coming along in the breakers. One often meets with questions like these when in the sea, and I will take this opportunity of answering them. Back again to the line of breakers for the take-off. The wave is coming, and your chief consideration is now to pick it up, and get away. There are two recognised methods amongst shooters. The first is, as the wave goes to break or "catch" you, take one trudgeon kick, and you are off. You then bring your hands in between the thighs and hold your body rigid, your shoulders and head being well out and ahead of the wave. If the wave is strong and fast you will be able to throw your head high in the air, and arch your back. This is one of the prettiest things to be seen about a good shooter, and can only be done with a good wave, with plenty of power behind it - for preference, a double-banker. But, on the contrary, should the wave be weak, and inclined to drop you, it will be then necessary to hang the head low over the crest of the wave, hump the shoulders, and paddle the feet slightly, using the crawl kick. The paddling of the feet is not to be altogether recommended, as it detracts from the grace of the shooter, but still there are times when it is the only means of finishing on a wave. The second method of shootjng a breaker is with arms advanced under the water, as in the underarm stroke, and the legs ready for a trudgeon kick. As the breaker picks up, you draw both hands back, as in the first method, snap the legs together, and you are away, as before. There are many other so-called styles of shooting the breakers, such as standing on the bottom, and pushing-off in a diving attitude as the wave breaks. This is unpleasant, as your head is buried in foam all the time. Another practice is to take the wave long after it has broken, and start in the foam. It is indeed hard to get them properly, though the feat may be accomplished most easily with a surf-board. The surf-board is used to a great ,advantage on flat, shallow beaches. It is a piece of board, cedar for preference, about 18in. long, 10in, wide, and about half-an-inch in thickness. The rounded end is to the front when shooting. In taking a wave in deep water the board is held with the underarm hand. As you take off, one stroke is taken with the overarm hand, and then as you are coming down on the wave it is brought, forward on to the board, which is then held out rigidly in front of the body, with extended arms. In taking a wave in shallow water, whilst standing on the bottom, the board is held with both hands in front of the body. As the wave comes down you swing forward from the bottom, bringing the board with extended arms out in front, and in that way go ashore. There are other ways of shooting with boards of much larger proportions, but as the methods are not carried out in this country I will refrain from describing them here. A point which I have so far omitted, and which, to my mind, gives a very great finish to one's water craft, is trick or fancy shooting. What finer sight is there, or one carrying so much grace and finish, than for the shooter, as he takes off, to complete one, or even two, revolutions, whilst coming down the crest of a huge billow? This performance is commonly known as the "roll," and is only negotiable by our best shooters. There is also the "back shoot." Instead of taking off in the front, as before, you take off on your back, and remain that way till you get ashore. There is also the "double shoot." In this, two shooters get away together, and come down the breaker double-banked, or one on top of the other. The one who is to have the top position requires to be much lighter than the one underneath. Yet another pretty movement is to take the wave on your back, and as you are coming down with the crest, to gracefully roll over on your front. If the half-roll is completed with finish it will bring you out, quite to your hips, in advance of the wave. A delightful sensation, indeed. As a shooter is cavorting, or coming down, there is nothing finer than to see him soaring from his left to his right side. It has the same appearance as a bird hovering. One of the hardest things to perform is to roll twice on the take-off, shoot in on your front for some distance, and roll again once, and then still onward. You need a double-banked wave for it. ... bathers, in that it either breaks or makes your swim. It is the much-dreaded undertow which in the past has been responsible for so many tragedies. This loss of life would be greatly minimised if bathers unfamiliar with the spot would take particular care to inquire as to the part in which they enter. They should never heiitate to ask one who swims frequently at the spot where the safest part for bathing is. There are two distinct kinds of under- tow, or, more correctly, current. One, which is nearly always to be seen at the rock end of a beach, sweeps round the rocks into the sea. Then, again, there is the current which runs out at different parts of the beach. It is difficult to set a hard and fast rule as to the means of getting out of an undertow when caught in it. It is harder still to allow yourself, in the recognised way of getting out of an undertow, to be carried out to sea in the current tin it expends itself. This, however, is one way. Another, and most effective one, too, is to swim across the current until you are clear of it. An undertow, by the way, is rather a grim finish to a chapter on surf-bathing, but I trust that after following the forms of physical culture set forth in this book all the readers will be strong enough to stem the strongest current that ever ran. 1909-10, won several alarm reel races and resuscitation events in the surf. also, represented combined Metropolis lsts against Combined American Universities. 1907-8-9, won Wrestling-on-Horseback Championship of Sydney Squadron N .S. W. Lancers. While this book was in the press, the people of Sydney in particular, and Australians generally, were thrilled by the accounts of heroic exploits performed by Harold Baker in the surf at Coogee on January 28th. The young champion is no tyro as a life-saver. It is estimated that he has snatched over a hundred from a watery grave - in many instances at much risk to himself; but this latest and greatest of achievements has set the seal on his fame. Shortly before mid-day on the date mentioned, Baker noticed that a number of persons in the water at the popular Ooogee Beach were in difficulties. Fully dressed as he was, he swam rapidly to the mass of struggling, choking, despairing bathers, who had been carried far beyond the safety zone by the force of the strong current, running in a deep channel caused by storm waters from the land. Then ensued a terrible time. The drowning men and women clutched frantically at their rescuer, and it was only after super- human efforts that he sucooeded in quietening them sufficiently to be able to get to work. One by one he bore the helpless bathers a'shore, shedding portions of his garments as he returned, until at length he worked in comparative freedom. James Clarken, a well-known footballer, also dashed to the rescue, and he and Baker succeeded in safely bringing ashore no fewer than ten women and men who were on the point of perishing. Unfortunately, four lives were lost, despite the desperate efforts of Baker and Olarken, who were subsequently much downcast by the tragedy. A day or two later Mr. Hugh Ward, the actor-manager, came forward with the proposal to raise £1000 for the purpose of rewarding the heroes of the Coogee sensation. The idea was taken up with alacrity, subscriptions poured in rapidly, and a big sum was raised by an athletic carnival on the following Friday. In very little over a week the sum called for was in hand - apart from a substantial fund raised for relatives of the victim's - and Harold Baker and James Olarken were given tangible proof of the public appreciation of their bravery and self-sacrifice. In addition to the a'bove monetary reward, the Royal Humane Society has decided to confer upon each of the two heroes its, highest distinction - a gold medal. The Noted Swimmer, Surfer, and Lifesaver." Melbourne. G.Robertson & Co., 1910. Page 53. With Articles On Special Subjects By Leading Australian Athletics. Geoff Cater (2007-2016) : Harold Baker : Surf Bathing, 1910. BAKER, R. L (SNOWY). A Little Light On A Big Subject. 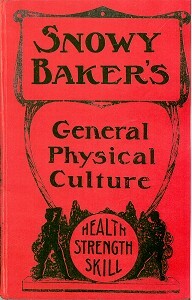 Baker Recreative And Scientific Physical Culture And What It Signifies. Syd. R.L.Baker., 1909., 1909. 16mo. (48pp). Plates: Fully Illustrated With B/W Photo's. Orig Coloured Illust 1st ed. "Book Appears To Have Been Issued When "Snowy" Baker Opened His Physical Culture Studio In Sydney, Contents Include Biography On Baker + His Athletic Record, Enlistinmg In His Studio The Follwing Will Be Taught. The Benefits Of Boxing, Benifits Of Scientific Physical Culture, Scientific Excercise, Swimming, Treatment For Obesity By Natural Means." "THE SNOWY BAKER STORY is an action-packed romp full of astounding true tales and 16 pages of fabulous photographs and images. Reginald 'Snowy' Baker - a non-drinker and health and fitness fanatic - represented Australia in three sports at the 1908 Olympic Games, played in two rugby union tests, represented his country as a horseman and travelled the world as a champion swimmer, diver and boxer. His life story is entwined with the stories of all the major sports figures of the first half of the 20th Century: Frank Beaurepaire, Les Darcy, Duke Kahanamoku, H.H. Dally Messenger and Freddy Lane.Snowy next embraced the life of an entrepreneur, potion maker, publisher and boxing promoter, mixing with many of the major figures in Australian social history before he and his trusty 'Boomerang the wonder horse' took up a career in film. Snowy starred, produced and undertook all of his own stunts in some of the first feature-length Australian films including The Man From Kangaroo.Then it was off to Hollywood where his escapades included filmmaking with Charlie Chaplin, teaching Rudolf Valentino to kiss and to fence, instructing Elizabeth Taylor to ride for National Velvet, playing polo with Roy Rogers, providing advice and a front for Spencer Tracy as he began his affair with Katharine Hepburn and protecting a philandering Douglas Fairbanks Snr from his wife.A full life indeed for a working class boy from Surry Hills." Note: Includes image of "Baker, Kahanamoku and Beaurepaire"
" Reginald Leslie (Snowy) Baker (1884 - 1953), by unknown photographer, courtesy of State Library of New South Wales. Original : PXE 653 (v.58)." - sportsman and showman, was born on 8 February 1884 at Surry Hills, Sydney, son of George Baker, an Irish-born Sydney Municipal Council clerk, and his wife Elizabeth Jane, née Robertson. Very blond, he was called 'Snowy' from childhood; he was educated at Crown Street Public School and, reputedly, learned horsemanship at dawn work-outs on Randwick Racecourse. In 1897-99 he won a series of swimming championships for his school, swam and played water polo for the East Sydney Swimming Club, and in 1901 finished second to R. Cavill in the State half-mile championship. He did not, as was later claimed, study engineering at the University of Sydney or win several 'blues'; he may have worked for the Colonial Sugar Refining Co. as an engineering draftsman. He played Rugby Union for Eastern Suburbs and represented New South Wales at half-back against both Queensland and the touring Great Britain side in 1904. A 'rare tackler … and as hard a player for his weight as has been seen in the game', he played for Australia in the first Test. As an oarsman, he rowed for the Mercantile Rowing Club in championship maiden and junior fours and eights in 1905-06; he was also a capable cricketer. Print Publication Details: W. F. Mandle, 'Baker, Reginald Leslie (Snowy) (1884 - 1953)', Australian Dictionary of Biography, Volume 7, Melbourne University Press, 1979, pp 150-152. Reginald Leslie “Snowy” Baker, Australia’s greatest all-round athlete, competed in 26 different sports, and excelled in all of them. He was an international footballer, swimmer, boxer and diver, and was in championship class as a horseman, rower, wrestler, polo and water polo player, track athlete, fencer and gymnast. He remains the only Australian to have represented the nation in three separate sports at the Olympic Games, and he played rugby union for Australia against the touring Great Britain team in 1904. At the London 1908 Olympics, he competed in the boxing, swimming and diving, winning a silver medal in the middleweight boxing division after losing narrowly on points in a hard-fought encounter with Britain’s J.W.H.T. (“Johnny Won’t Hit Today”) Douglas. Douglas, who earned his nickname as a stonewalling cricketer, later captained England on a Test tour of Australia. Baker’s Olympic boxing performance has been matched by only one other Australian – light-welterweight Grahame ‘Spike’ Cheney, who won silver in Seoul in 1988. Baker was a member (with swimmers Frank Beaurepaire, Theo Tartakova and Frank Springfield) of the Australian 4 x 200m freestyle relay team that won its heat and finished fourth in the final. He had little preparation for his springboard diving event, and finished sixth in his heat. Baker had a varied post-Olympic career, most notably as a boxing referee, boxing promoter, entrepreneur, writer, actor, film-maker, Hollywood stuntman and director of an exclusive country club in California. During the 1932 Olympics in Los Angeles, he was both Australia’s team attaché and a perceptive correspondent for the Sydney Referee. Vol 1, no. 1 (Jan. 1912) - Date publication ceased is unknown, probably 192-?